This show only lasted 10 seasons, so it’s no NCIS. But this show gave us a couple songs. Guest star Erica Gimple sings “We’ll Catch Up” (not too Christmassy and only half a song, but amazingly uninterrupted) and “Wishing It were Christmas” with a USO PSA. Now that’s a holiday assault. This formulaic yet well cast sitcom inspired foreign TV (usually the other way around) with the power of personae. The 1995 Christmas special ‘Oy to the World’ did not apologize for a JAP in a WASP-hold, but shrugged and whirled in cartoon form. The minute and a half showstopper midway through the morality lesson showcases Daniel Davis as the head elf Elfis welcoming Fran Drescher to Santa’s toyshop. No helpful Youtube exists of this song, so i hacked it as best i could. Nine seasons with 2 spinoffs, but the kids who cared were grown and everyone else thought it was creepy. The holiday album Rugrats Holiday Classics is delivered after the original series ended. That’s why you probably haven’t heard of it. It’s all half-asleep parodies milking the misheard lyric premise of stupid babies. Okay, a couple at least try. “Rugrats Chanukah” is ‘The Dreidel Song’ with a cheap electronic keyboard honking at kvetching children. 1980s pop and lock rock marks “Oops! Santa Got Stuck!” about Santa ‘Up on the Rooftop’ while Chuckie jest gotsta go wee! “Toys for the Girls” has Angelica bull-leading a female chorus celebrating the new baby, oddly enough. Maybe Jesus, maybe her baby brother (uhh, that was a miscarriage). Thus begins the nuevo wave-o of ’90s cartoons from cable channel Nickelodeon. The disgusting dog and cat gross-fest woke up a new generation previously taught not to pick their noses in public. By 1993 a holiday album Ren & Stimpy’s Crock o’ Christmas an original story spunoff of their Yaksmas holiday shenanigans. I have offered songs from here before, so let’s mention a couple new ones before i barf. Concert rock is the platform for the contrariness of “Decorate Yourself.” Should have mentioned this one earlier. Starts out amusingly…. Ren has the holiday blues for the whole album, despite Stimpy’s antic efforts to cheer. “I Hate Christmas” is the hilarious plot twist revealing the fat dog still grumbles. Smooth lounge blues. Father-son sentimentality is pretty straightforward in “What is Christmas?” which i guess reveals the irony of the ’90s. If it’s honest emotion, sneer for all you’re worth. Quiet pop. The juggernaut of prime time cartoons has outlasted the age of irony, post-irony, and colonial irony. 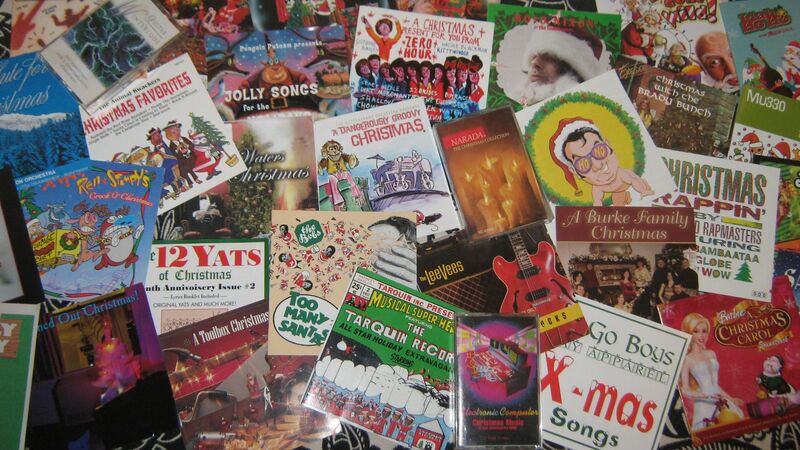 Naturally most of its holiday contributions are parodies of carols (caroldies). Better are the Nutcracker bits. An independent TV toon that’s lasted for decades and offered music too, this playground of stereotypes need to work through their childish ways and become stiff upper lipped. And sing about being of use (why do i think of Boxer in Animal Farm?). Not a follower, but i can tell “Glynn’s Christmas Wish” is later on with the uncanny valley scariness of the computer animation. Nice Brit pop story. More derivatively carol-like, “There’s Snow Place Like Home” just sells it all the way out. Learn, kids, learn! Less hyper, “It’s Christmas Time” is a measured consideration of pomp and celebration. Stand straight when you sing this one. Then you’ll get a lump of coal in your throat.